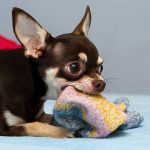 Does your dog seem overly itchy, scratchy or licks a lot? 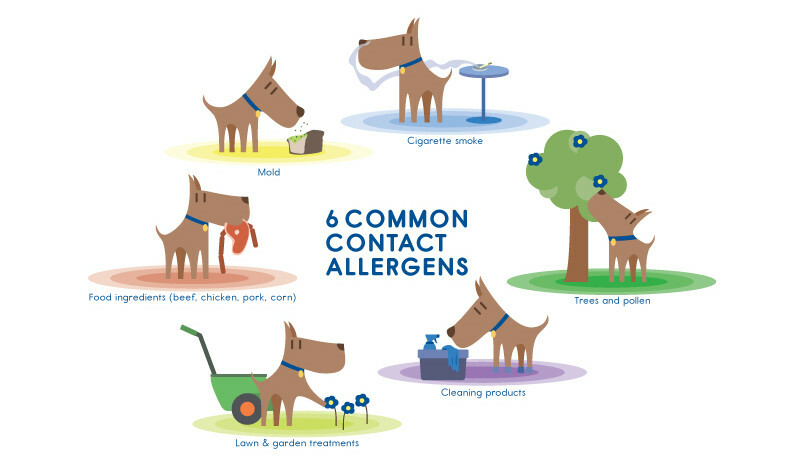 Chances are that your dog suffers from an allergy. Allergies in dogs are almost as common as they are in people and it is been estimated that nearly 20% of dogs suffer from allergies, with increasing tendency. As they are for humans, so are allergies for dogs: uncomfortable, itchy, annoying, irritating and sometimes very painful. On top of this: all the itching, scratching and licking can cause secondary infections, which worsen the symptoms even more. 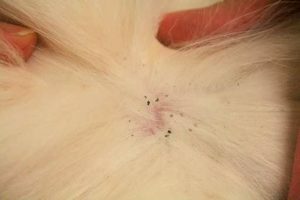 As a result your dog can lose hair which causes so called “hot spots”. To produce an allergic reaction, it takes more than one exposure to the allergenic substance. White blood cells in the animals body build up a memory of the allergens. The more contact made, the more the body releases histamines and the itchier your dog will be. As with all allergies, unfortunately they can’t be cured but can be managed. This article explains the different types of allergies in dogs, their symptoms and how they can be treated. We also talk about how allergies are diagnosed and the dog breeds that more prone to skin conditions. Atopic Dermatitis is an environmental allergic reaction to certain substances like pollen, moulds, dust mites and even animal dander (skin or hair fragments). Somewhat like hay fever in humans. 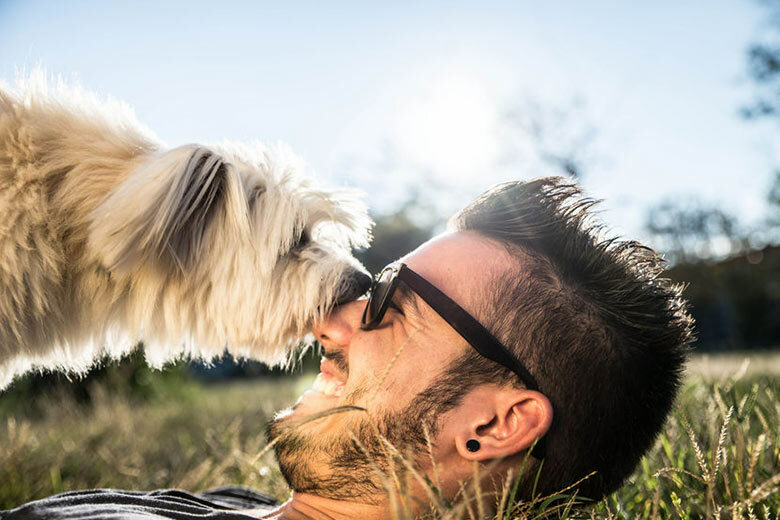 Dogs can get in contact with the substance through either inhalation or direct contact, and these allergies can be seasonal or all year around depending on the presence of the allergen. In most cases of atopic dermatitis, the allergens penetrate directly through the skin microscopically to bring out an itch response. Through a higher concentration of the substance (e.g. pollen in the air), the animals body will release excess histamine which then prompts the symptoms. Atopic allergies result in itchy skin and the most common signs are scratching and chewing of their armpits, between their hind legs and abdomen, their face and their ears. You may find that they often lick or even chew their feet. 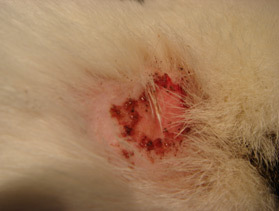 You will see redness in those areas, and licking and scratching makes it often makes it worse. This can cause bacterial infections on their skin and in their ears. Check your dog’s ears by pulling back the ear flap and look for redness and discharge. Even though some atopic allergies may start out as seasonal, they are progressive which means they get worse and your dog can become itchy year-round. Allergies to dust mites are also very common, which means the symptoms persists even through the winter months. Typically these symptoms start between 1 and 3 years of age, however an onset of these signs can be seen from as early as 4 months to 7 years of age. The only way to tell which of these your dog is allergic to is to perform testing at the vet. Anti-itch therapy using drugs (anti-histamine, corticosteroids, antibiotics to treat infections), medicated shampoos, conditioners and skin lotions/ creams. Whenever using drugs, always consult your vets on what and how to use them and be mindful of any side effects. Whilst we understand that this isn’t always possible, try to remove the source of the allergy as much as you can. Pollen can be carried up to 80km in the air, and dust mites are everywhere. In addition to this you can remove the allergenic weeds from your backyard. If you can’t avoid the allergen, wipe or wash your dog’s paws to manually to remove allergens after walks and hikes. 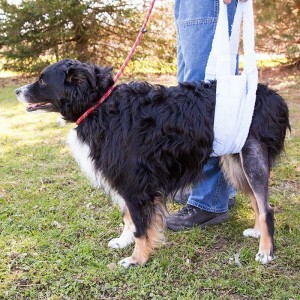 If the symptoms are mild and very occasional, you can stop your dog from scratching by using Elizabethan collars, socks or t-shirts to reduce trauma and so reducing the risk of infection. Hyposensitation therapy (allergy “vaccine” shots) is where, through a series of injections your dog will gradually become desensitised to the allergens. The effectiveness can vary, however in 75% of pets some relief has been recognised. 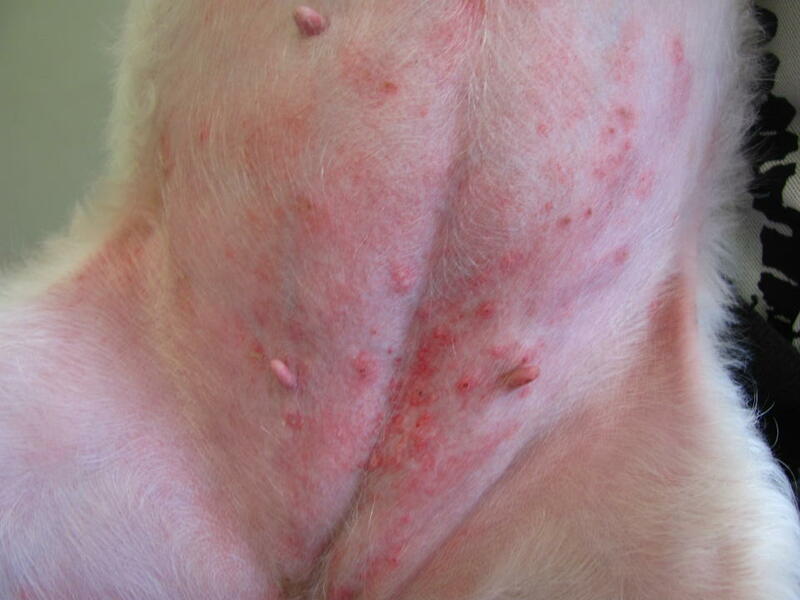 Flea allergy dermatitis (FAD) is also called “flea bite hypersensitivity”, and is an allergic reaction to flea saliva. Not many flees are needed to cause a dog intense itching. 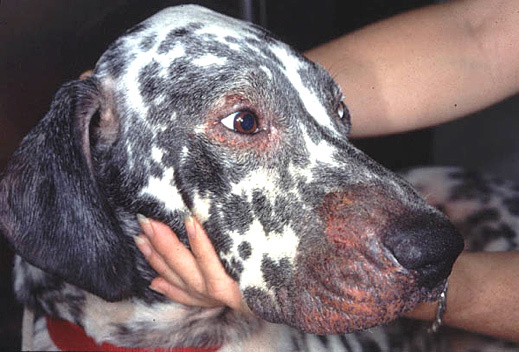 It is the most common allergic reaction in dogs, and about 50% of dogs suffer from FAD. In rare cases, dogs have been found to be allergic to other insects such as mosquitos and midges. Dogs that are allergic to fleas will chew and bite their backs, back legs, bellies or tails – sometimes even until it bleeds! The skin often becomes red, raw and painful and you may see little flecks of flea dirt (which is flea poo). 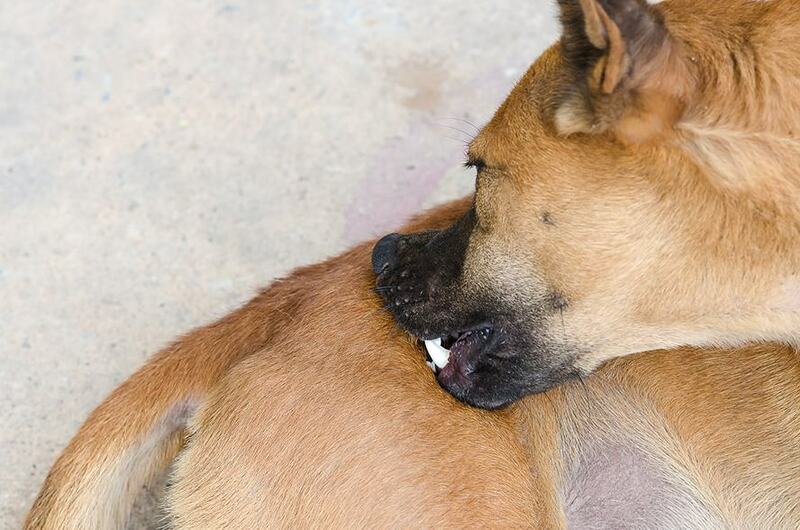 Flea bites often lead to hot spots due to the trauma from dogs chewing themselves. As fleas are pretty much everywhere, it is close to impossible for your dog not to have fleas unless the animal is on a good-quality flea control product all year around. The most effective way is to be very diligent and use products to kill and prevent fleas from infesting your dog. There are many effective and convenient products these days and you should ask your vet for advice. You should also vacuum regularly and wash your pets bedding frequently in hot water (>60 degrees celsius). 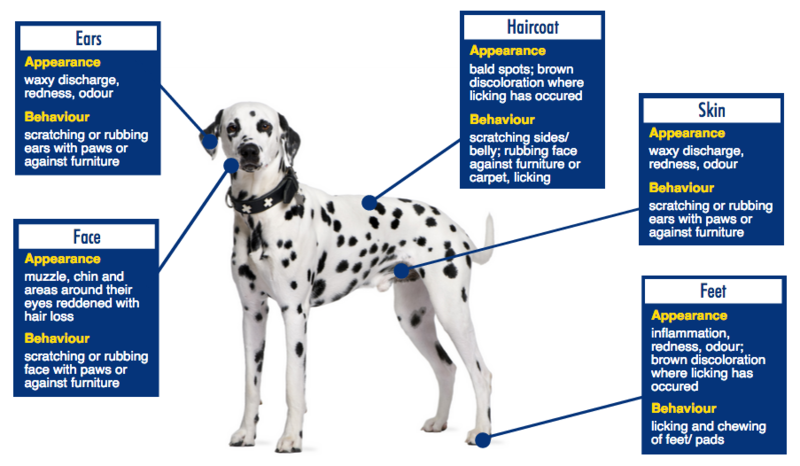 Be aware of potential flea infestations if you have other dogs visiting (especially if you don’t know whether they are on flea control or not) or if your dog visits places where there are other dogs, such as dog boarding, doggy daycare, doggy playdates etc. Once you have a flea infestation on your dog and in your home, it becomes a nightmare and is very difficult to fix, so flea prevention all year round is really important, and even more so if your dog has FAD. Make sure all pets in the household are treated also. Your vet may prescribe steroids and antihistamines to break the cycle of itching and scratching. Regular warm baths with medicated anti-itch shampoo and conditioner also help. Click here to learn more more about how to control fleas. It is not clear what causes a food allergy. It is assumed that changes in the pets immune system can let his body suddenly see certain ingredients as ‘foreign’ and therefore they need to be fought, which is what causes the allergic reaction. Fortunately, it is relatively uncommon. The main symptoms are itching, licking and chewing, especially around the face, paws and ears. This can be accompanied by ear and skin infections, unpleasant skin odour, excessive scaling and red bumps or pimples. In some cases, symptoms can include indigestion, noisy gut sounds, intermittent mild diarrhoea and vomiting. Diagnosis is a long process which involves working very closely with your vet for months using a system of diet trials. Once you know exactly what your dog is allergic to, then it can be managed more easily. Once you know what your dog is allergic to, you can manage your dog’s diet in order to avoid flare-ups. 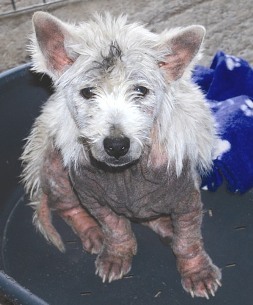 This is when the skin becomes worse and intense treatment is required. In rare cases, your vet may prescribe medication such as antihistamines and steroids. If you are visiting your vet more than 3 trips a year for itching, ear or skin infection, ask your vet about dog allergies. Allergies cannot be cured but can be managed successfully with patience and diligence. 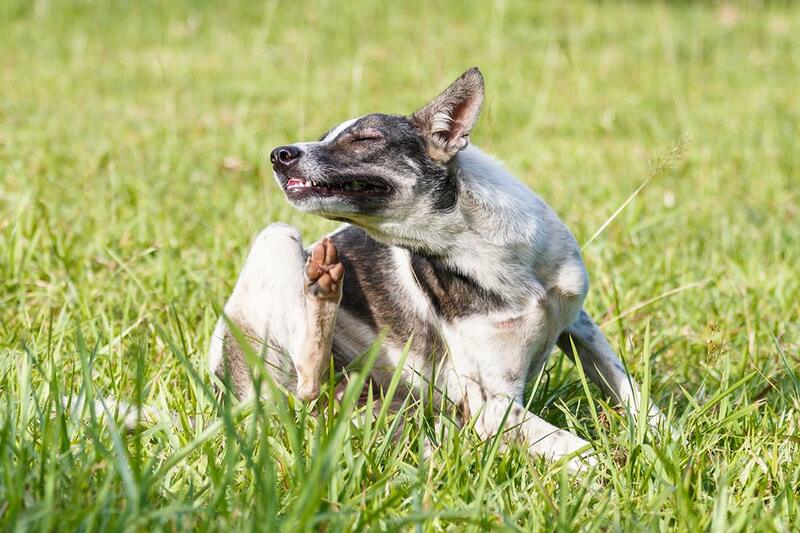 Keeping a detailed history of your dog’s itching problem will be helpful for the diagnosis. This means monitoring and recording the symptoms in detail: the signs, when they occurred, what happened before and any treatments and results. Your vet will suspect an allergy based on symptoms but will first rule out common and curable causes of itching such as fleas, mites, bacteria and yeast infections. 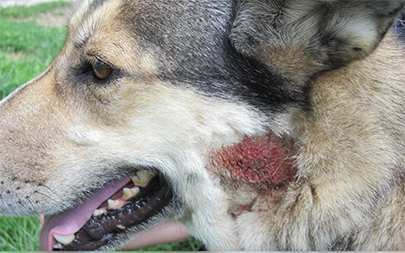 Find out more about other skin conditions in dogs. Keep in mind that symptoms of different dog allergies are very similar, which can make it hard to tell the difference. It is best is to consult your family vet. Testing for atopic allergies is done through skin or serum (blood) testing in a similar way it is done for people. With flea allergies, vets often look for a typical distribution of skin inflammation as well as the usual signs such as the presence of fleas and/or flea dirt, scratching and skin sores. 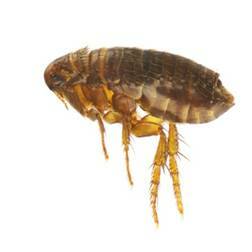 Often they will prescribe a specific flea therapeutic trial to determine whether fleas are the problem. To identify a food allergy, the dog will need to be put on an exclusion diet for 8-12 weeks, which means the animal gets fed ingredients it hasn’t had before. The dog cannot eat anything else at all for that time. As food allergies are less common, it is best to work with your vet to make sure it is in fact not something else that can easily be managed. Irrespective of the type of allergy your dog is suffering from, it is very important to reduce the symptoms as much as possible. Anti-itch therapy drugs should be prescribed by your vet but there are other helpful products available through pet retail stores and veterinary clinics. 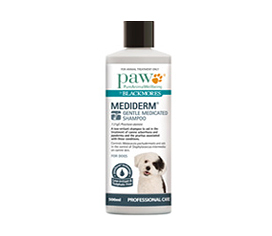 Products such as gentle medicated shampoos, conditioners, skin lotions/creams and fish and linseed oils help to reduce skin irritations, fight secondary infections and assist with healing your dog’s skin. 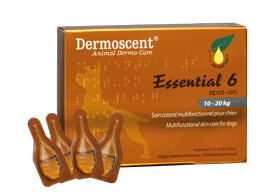 Supplement is specifically designed for skin health. 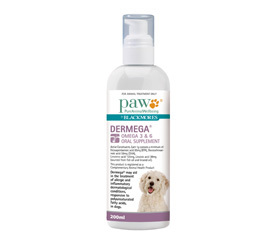 Containing omega fatty acids, PAW Dermega aids in the treatment of allergic and inflammatory dermatological conditions responsive to polyunsaturated fatty acids in dogs. Shampoo is the gentler, faster, safer and effective way to treat skin infections with the new veterinary active, Piroctone Olamine. 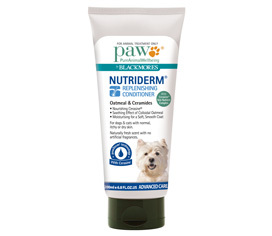 Conditioner is an innovative, advanced way to moisturise and provide key nutrients to your dog’s skin as well as leaving the coat silky smooth and fresh. Containing advanced Cerasine® skin nutrient complex this product is suitable for dogs and cats with normal, dry and itchy skin. is a unique blend of essential fatty acids & essential oils that reduces odour and moisturises dry skin and maintains coat and skin health. Available in a convenient spot-on pipette that is applied directly to skin. It’s easy for pet owners to use without bathing their pets. Are all dogs prone to allergies? Generally, every dog is at risk of an allergic reaction to a substance. Some breeds however are more susceptible than others due of genetics, making their skin more fragile and sensitive to allergens. If your dog suffers from an allergy, we recommend you do not breed this dog, as it is often an inherited condition. Allergies in dogs are more common than most of us think, and the number of allergic dogs is increasing. There are many different things that can cause an allergic reaction in our dogs. Whilst you can’t cure allergies, you can manage them so your dog can live a comfortable, almost itch free life again. You will need to consult your vet or a specialist (dermatologist) to identify the type of allergy your pet is suffering from in order to find the best treatment suited to your dog. Arthritis in dogs and cats Arthritis is a general term for abnormal changes in a joint. Usually it relates to inflammation of the joint, which hampers movement and causes discomfort and pain.